FEDERICO PARRA/AFP/Getty ImagesVenezuela’s National Assembly head Juan Guaido. Juan Guaidó, the Venezuelan opposition leader who declared himself interim president, has disappeared from the public eye. It comes as Venezuela’s military leaders declared their support for embattled President Nicolás Maduro. Guaidó previously said he needed the support of the Venezuelan people, the international community, and the military to secure power. He does not have military support. Tens of thousands of people called on Maduro to step down this week. He has not budged. Juan Guaidó, the Venezuelan opposition leader who declared himself interim president this week, appeared to be in hiding as the country’s military leaders declared their support for his rival, President Nicolás Maduro. The whereabouts of Guaidó, 35, remains unknown after he symbolically swore in as the country’s interim president on Wednesday before tens of thousands of supporters, promising to remove Maduro from power. Guaidó has said that he needs support from three groups: The Venezuelan people, the international community, and the military, The Associated Press reported. He hasn’t passed all three tests yet. The long list of countries supporting his claim – including the US, the EU, and most of Venezuela’s neighbours – gives him a good argument that he has persuaded the international community. It is difficult to measure Guaidó’s popular support, though his rallies have pulled in huge crowds. Tens of thousands of Venezuelans marched in support of Guaidó this week. Venezuela’s military, however, is much more clear-cut. Its leaders have remained staunchly loyal to Maduro. Guaidó told the Univision TV channel from an undisclosed location on Thursday that he would not rule out granting amnesty to Maduro and his military allies if he secures power. “Amnesty is on the table. Those guarantees are for all those who are willing to side with the Constitution to recover the constitutional order,” he told Univision. He appeared on a low-resolution video feed against a blank background, with poor-quality audio. UnivisionGuaidó spoke to Univision from an undisclosed location on January 24, 2019. Venezuelans protested against Maduro for days this week, describing his presidency as unconstitutional and fraudulent. 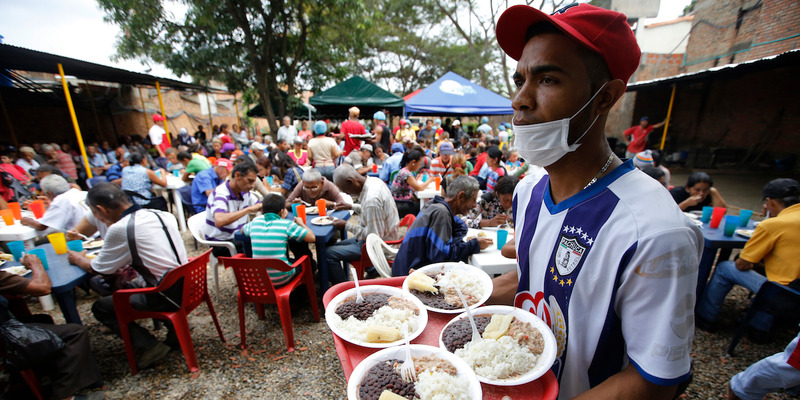 Under Maduro’s rule, Venezuela is going through one of the world’s worst economic crises, with hyperinflation, power cuts, and food shortages. More than a million Venezuelans have fled the country into neighbouring Colombia, with hundreds of thousands more in Peru, Ecuador, Argentina, Chile, and Brazil. (AP Photo/Fernando Vergara)Venezuelan migrants at a shelter in Cúcuta, Colombia, in February 2018. More than 1 million Venezuelans have fled the country’s economic crisis. US President Donald Trump declared his support for Guaidó on Wednesday, shortly after he swore in as the country’s interim president. Shortly after Trump’s announcement, Maduro told all US diplomats in the country to leave within three days. Washington has refused to comply. The EU, Canada, and almost every country in Latin America also recognised Guaidó as president. Russia, Turkey, Bolivia, and Cuba have explicitly declared support for Maduro. China, Iran, and Syria condemned what they called US interference in Venezuela’s domestic affairs.